Hello there! I was going to start off this post by saying something along the lines of, “I don’t know about you, but I sure need some stress relief in my life sometimes.” But that’s silly. Because, even though I don’t “know you” I do know you need some stress relief sometimes. WE ALL DO. So I want to talk to you for a minute about one of my most favorite and hated oils. Yep, I said it. Read on to find out why Stress Away is my oil of the week. 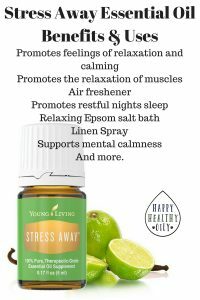 Stress Away is a blend by Young Living that was formulated with specific oils in mind to, well, I don’t know, make stress go away? Of course this isn’t a magic potion that will eliminate the stressors of your life. However, it does seem to make things easier to deal with sometimes. Stress Away has Copaiba, Lime, Cedarwood, Vanilla, Ocotea, and Lavender. Those are a bunch amazing oils for promoting emotional support. Copaiba has soothing and calming properties, Lavender and Cedarwood are relaxing, Vanilla is said to have properties that make you feel happier, Ocotea helps with feelings of anxiousness, and Lime is uplifting. Seems like a pretty good combo to me. There are so many ways people love to use this oil. One of the most popular is by diffusing. You can either diffuse it alone, or with Lavender for a “spa like experience”. It is also great to add to an Epsom salt bath. If you have trouble sleeping, diffusing this may help you feel calm enough to get a restful night’s sleep. Another great way to benefit from this essential oil blend is to add the roller fitment (comes in the Premium Starter Kit) to the bottle and roll it on your wrists, back of neck, carotid arteries, or heart. 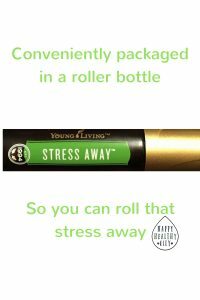 This is such a popular way of using this blend that Young Living actually created their own Stress Away roller. It’s all the same oils, just conveniently bottled in a roller bottle for you. But here is my personal take on the oil. I cannot stand the smell. In fact, I think smelling it may make me angry or more stressed haha. A good friend of mine, and fellow oiler, says that if you have an extreme reaction, whether positive or negative, to an essential oil, it’s because your body NEEDS it. Well, I do have an extreme reaction to this oil. Stress-Away was the very first oil I diffused when I got my Premium Starter Kit. There was a bunch of chaos going on at home and D1 came home from work cranky. I texted my enroller and asked her if there were any oils I could use. She instructed me to diffuse Stress-Away. I did. And I was so very disappointed and wondered what I had gotten myself into with this essential oil stuff. I did NOT like the smell. In fact I didn’t want to be anywhere near it. But I let it run until the diffuser shut off. I was secretly glad. Since then, I have not found another oil that I dislike so much. I have, however, found another oil that I do have an extreme happy feeling when I use, which is Joy (I’ll talk more about that one in a later post). I’ve done some research and every where I turn leads back to the same statement my friend told me. I have such a strong dislike for the oil because I NEED it. When you smell oils, the scent travels to the limbic system of your brain. That’s where our feelings and emotions are housed. Scents trigger emotions and memories. Ever smell someone’s shampoo, and think back to another time when you smelled it? Or does the smell of rain take you back to your childhood when you would dance in the rain? So, of course I believe that there is something in Stress Away that is a trigger for me. But I also feel I need the benefits of Stress Away. Remember, a few posts back I mentioned how we are dealing with a court issue and with keeping D3 and D4 in our lives? You’ve got to be completely out of your mind if you think that is not a stressful situation. So what am I supposed to do? Can’t stand the smell, but want the benefits. I put it on the bottoms of my feet, that’s what! I can’t smell it from there, but the oil still enters my skin, reaches all those nerve endings down there and travels through my blood stream. So I still get the “benefits” without the negative side effects it bestows on me. I am supposed to be digging deep, emotionally, and trying to figure out why this triggers such a negative response from me. But, you know, time. I don’t have any of it. Hmm…. that could be adding to my stress… In the meantime, I will continue using the oil. Because I do feel it is a great one for helping to manage the feelings that come with stress. And for what it’s worth I am the only person I know of who feels this way about this oil blend. Epsom Salt Bath – Mix 5 drips Stress Away Oil with 1 Cup Espom salt then add to a warm bath for a relaxing bath. Car Freshener – If you don’t have the Orb diffuser, you can add a few drops of Stress Away to cotton balls and add them to your car vents. Muscle Tension Relief – Use the Stress Away Roller and roll the oil on sore muscles. Or add a few drops to a carrier oil and massage your muscles. Add to a diffuser necklace or bracelet. You can make your own or buy them here. Linen Spray – It’s great to spray on your sheets before bed. Or just use as a room freshener. Add approximately 1 tblspn witch hazel, vodka, or rubbing alcohol to a 2 oz spray bottle. then add 10 drops Stress Away oil and fill the rest of the way with water. Give a little swirl and spritz away. You can find other spray recipes on this post. Inhale directly from the bottle. Sometimes you just need to step back from the situation and take some deep breaths. Stress Away is great to add to that moment. Breathe in deeply several times while inhaling directly from the bottle. Feel free to reach out and share your experiences with Stress Away or another oil that you may have an strong reaction to. I’d love to hear what oils are doing for others!